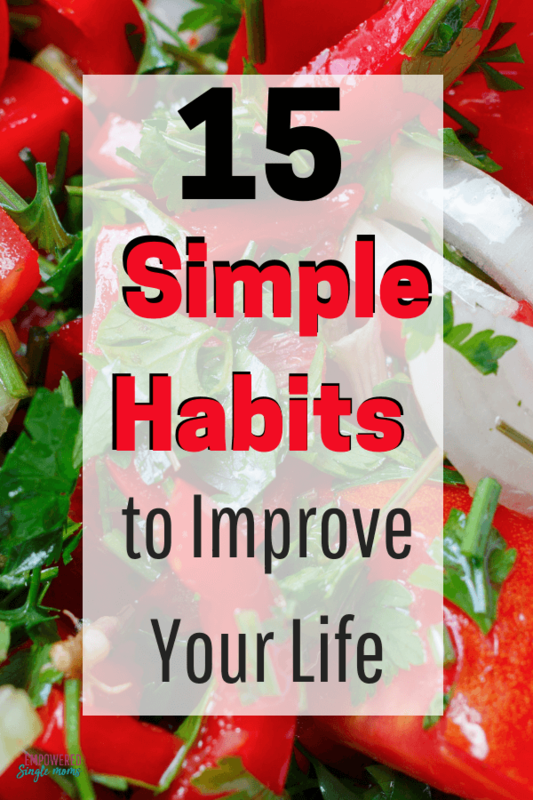 Inside: Discover 15 simple habits to change your life starting today. How do you make a positive change in your life? Since the first of the year I have been working on making healthier food choices and exercising more. One thing that has helped me a lot in this is using an app to track my choices. You change your life by being intentional about the decisions you make and the way you use your time. Instead of needing to make multiple decisions every day to improve your life it is much easier to decide on the kind of person you want to be and the life you want to live. Identify a habit that the new you would practice. Take one small simple step every day to make that behavior a habit. When a behavior becomes a habit it is something you do without a lot of thought or stress. We are changing every day. To be alive is to deal with change. Think of how much your children changed in the first 5 years of life. Each decision is a step in a direction. Be intentional about the way you are changing your life by choosing to practice these habits. What are the best habits? The best habits are things that improve your life. Start with developing habits that facilitate a healthy body. A healthy body gives you health and energy. What should we do daily? Start with the first 4 habits. The first 3 are the foundation of physical health enough sleep, exercise, and healthy eating. Good physical health is the foundation for good mental health. Good mental health is the foundation for joy. The fourth habit is a great starting place for a mindset that supports good mental health, happiness and reaching your full potential. Sleep deprivation contributes to all forms of problems including irritability, anxiety, depression and weight gain. Prioritize enough sleep. According to the Mayo Clinic website, adults need 7-9 hours a night. According to the National sleep foundation, the appropriate amount of sleep for adults may range from 6 to 10 hours of sleep. A physician at our local sleep center told us on a tour some rare people need 11 hours of sleep to feel fully rested. With experts saying you need between 6 and 11 hours of sleep how do you know how many hours of sleep you need? Do you feel rested when you wake? Are you able to wake up without an alarm or easily get up when the alarm goes off? These are signs you are getting enough sleep. Feeling fatigued is a sign that you need more sleep. During times of emotional and physical stress, we often need extra sleep. A regular exercise routine does wonders for your mental and physical health. Studies show that a brisk reduces anxiety and improves your mood. Exercise helps you lose extra weight, stay toned and increases energy. It is one of the best and cheapest stress reducers. You are much more likely to eat healthy meals when we plan them. You will also save money on groceries and eating out when we have a meal plan. Use these meal plans to make eating healthy meals at home easy. Vegetables are low in calories and high in fiber and vitamins. Most of us don’t eat enough vegetables. Eat them raw in a salad or snack, roast them, steam them or stir fry vegetables. Minimize sauces and dips to maximize health. Developing a growth mindset helps you develop optimism and grit. People with a growth mindset achieve more and have less stress. Videos to Teach Kids a Growth Mindset is a great resource to learn more about developing a growth mindset. All work and no play makes for a boring, exhausting life. Taking time for fun reduces stress and builds connections with friends and family. Having fun by yourself is relaxing and gets you in touch with who you are as a person. Too much screen time leads to low activity level, weight gain, and isolation. Try having no screen zone times to detox and give everyone more opportunity to connect with each other. Start with a couple of hours in the evening of no screens. Dream about what you want your life to be like and set goals to get you from where you are to where you want to be. Thriving a Single Mom Journal walks you through the process of setting goals and breaking them down into doable steps. Get your own copy here and start changing your life today. A healthy support system makes life more manageable. It gives you someone to ask for help or a listening ear when you need it. It also gives you people to share your joys with. A good support system lessons anxiety improves your mood and keeps you physically healthier. Some recent studies show that isolation is a high-risk factor for all kinds of physical health issues. Some recent studies even show it as a higher risk factor than smoking or obesity. When you have an evening routine that gets things ready for the next day you start your day with less rushing and less stress. You sleep better and are more likely to wake feeling rested. This is the evening routine that starts my day off in a calm positive way. Keep your mind sharp by learning something new every day. It makes life more fun and protects against diseases like Alzheimer’s. Read a book, listen to a podcast or audiobook. During your walk or on your commute to work are great times to learn something new. I am just finishing listening to this book, which is an attitude changer. Meditation grounds you and relieves stress. It can also strengthen your spiritual life if you meditate on connecting with God by focusing on listening to God or on a Bible verse during your meditation time. Make a budget so that you are in charge of your money. A budget makes sure that your basic needs are covered and you are making conscious decisions about what is a priority in your life. With a budget, you will never have to worry if you have money to pay your bills or not. You will know. Journaling helps you relieve stress. When you journal you get to know who you are, your priorities and dreams. It is also a great way to think through different ways to solve problems you are facing. 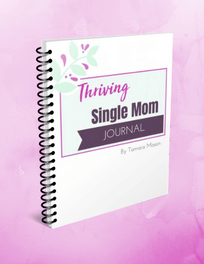 Thriving Single Mom Journal gives you a guide to identify your dreams and turn them into goals and plans. Get your copy today. Writing down 3 things you are grateful for every day keeps you focused on the positive in life. If you aren’t clear on your purpose in life reflect on your skills, gifts, and strengths. What gives you joy? What are you passionate about? How can you use these skills, gifts, and passions to make the world a better place? You deserve to live a life of purpose and meaning. 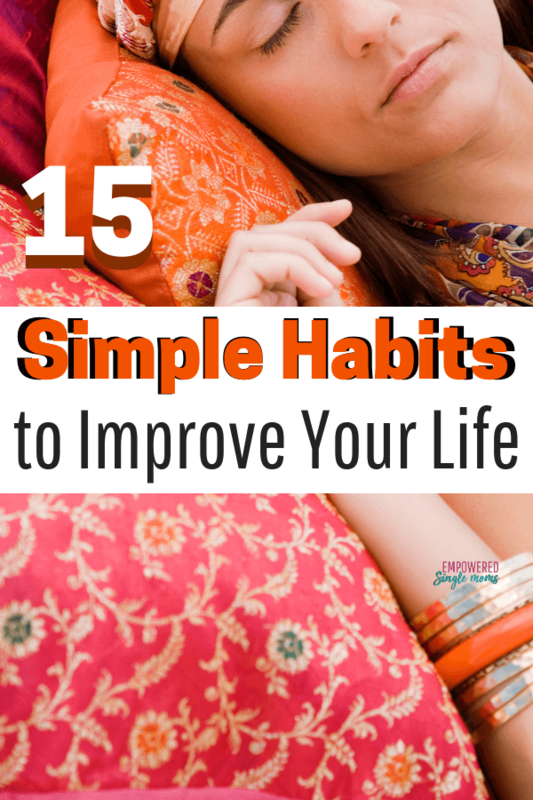 Pick one of these 15 habits and start practicing it. Set a goal to change one habit to improve your life. Track that habit. A written record keeps you accountable to continue practicing a new habit. Practice your new habit for 30 days. Get a free habit tracking sheet here. After 30 days notice how your life has changed. Keep practicing this new habit. Decide if you want to add another new habit. Imagine how much your life will change if you pick a new habit to focus on every month. Share your success in the comments below.